Since I have a propensity to lean toward animation I was looking forward to seeing this ever since I first saw the previews, what seems like so long ago. 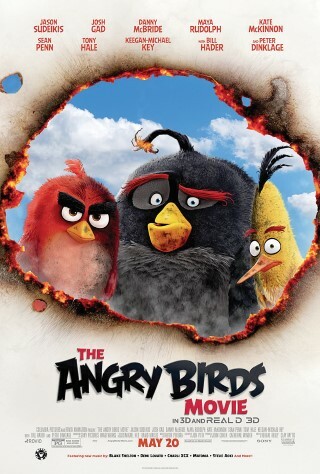 Angry Birds reinforced my belief that animated films are not just for children. There is good reason this particular film is rated PG rather than G. To this end I do encourage parents to bring their children but at the same time be prepared to do some explaining to them. Do not let this keep you from seeing this movie. Personally I thought it was hilarious. Angry Birds is a 3D computer-animated action-adventure comedy based on the video game series of the same name. Relatively unknown Director Clay Kaytis cleverly reveals the source of the birds’ anger with the help of co-director Fergal Reilly whose experience includes the voice of O’Toole in Open Season (2006). Writer Jon Vitti (The Simpsons Movie (2006) provides the humorous dialog with an endless repertoire of euphemisms. In addition to Red, these remarks are delivered by the likes of Chuck and Bomb voice by Josh Gad and Danny McBride respectively. These three are center stage when a mysterious green pig named Leonard (Bill Hader) arrives on the island paradise. Generally speaking, Bomb is probably the mellowest bird you will ever meet. However, get him worked up and it’s another story altogether. He has a tendency to go off, literally. While this can have its advantages, Bomb needs to control his power. . It is here the plot thickens and the story begins to meld. Enter the surprise visitors from another island. Witness green pigs with a pension for creating a party atmosphere; but they have an ulterior motive. Clever distractions soon reveal their purpose. The birds’ resilience is tested and an unlikely obscure hero emerges. There is much to be taken away from this film. It has numerous subliminal messages for adults and children, coated with quality entertainment.